Art lesson #5 - Featured artist is Frank Lloyd Wright. Slide assemblies take students on an exciting tour of Frank Lloyd Wright's most famous buildings - inside and out. Students gain an understanding of the role of the architect in preserving the natural environment - and of organic architecture in America. One point perspective and template drawing techniques highlight student studio art work. Volunteer Sign Ups to be sent out in April. Over 700 t-shirts and over 150 sweatshirts were ordered. Thank you to all of the parents who helped process the orders. We could not have done it without you!!! The orders were distributed on Friday, March 10. If there are any discrepancies or exchanges needed, please come to any of the sales times below. This is a Program enjoyed by our children that is funded by the monies raised by you our Gates families from the fundraisers you support. The assembly was titled: Who What Where/Write Away! Thank you Andrea Merchant for being our Assemblies Chair. She can be reached for any questions at assemblies.gatespta@gmail.com. We would like to get a big group of parents to attend this meeting to elect the new board for the 2017-2018 school year. Come out to support them! There will be some raffle prizes that night. The person who brings the most amount of people to the meeting will get a raffle ticket for every guest that they bring to increase their chances to win a prize. Come at least 10 minutes early to get your raffle tickets. Child care, translation and light refreshments will be available. The drive through and the restaurant was busy that night. Hope you all enjoyed dinner while supporting our school. Thank you Sonia Maceranka, Family Dine Out Chair for booking this fundraiser for us. Next dine out tentatively schedule in April. Stay tuned. We have 150 Kids Run the OC participants and we just completed the first 3 practices out of 10. The children are doing a fantastic job getting fit and taking on the weekly nutrition challenges. Turned in nutrition challenges are entered into a drawing for snack prizes. Kinder - Cindy Allen, Cheryl Harris, Youth Coach Antonio M.
Youth Coaches - Bella M., Olivia O., Sofia P., Nathan K., Antonio M.
Mandatory KROC Parent Meeting: April 27 from 7-8pm in the MPR. February 2, 9, 16, 23, March 2, 9: Volunteer Thursdays, 8:00 am to 10:00 am, Teacher's Lounge. This is a huge fundraiser. All hands on deck! Come out to help. Any amount of time would be appreciated. Packet was sent home end of last week. Bethany Ayala is our Jogathon Chair who is doing an awesome job planning our biggest fundraiser. She can be reached at jogathon.gatespta@gmail.com. Volunteer signup was sent out on Konstella. Thank you for participating in the largest PTA fundraiser. Funds raised pay for these programs: Art Masters, Kids Run the OC Marathon, Assemblies, the Variety Show, Family Fun Events (Astronomy Night, Movie Night, Camp Out), Teacher/Staff Appreciation and Book Fairs. Funds raised also provides school support for Emergency Preparedness and Field Trips for Kinder to 6th Grade. Thank you Bobbie Cunningham and Olivia Renella for chairing this wonderful Program. It is a wonderful event for our kids to showcase their talents. This will be Gate's 13th Annual Astronomy Night. It is a well attended event where everyone can learn a lot about science and the night sky. Thurs 4/6: 8am-3:30pm Last day of fair! This is a Buy One, Get One free (BOGO) book fair. For every book or item you buy, you get one of equal or lesser value FREE!! Volunteer to help at the book fair. Visit Konstella.com. Give aways! With every book purchase at the book fair from 5-7pm, you'll receive a fun giveaway! Raffles every 30 minutes! With every $10 book purchase at the book fair from 5-7pm, you will receive a raffle ticket for a chance to win scholastic dollars --$10, $20 and $30 will be raffled! Storytime! at 5:15 and 6:15! Volunteers needed April 1, Saturday from 1:30pm to 5:00pm to set up the book fair in the MPR. Email Brenda Thompson and Nancy Norris @ bookfair.gatespta@gmail.com to help. Thank you Brenda Thompson and Nancy Norris for chairing this wonderful Program for our children. Everyone loves the Book Fair!! Special Shout Out to Ryan Zinn, PTA Grant Writer Chair. He applied for a Healthy Lifestyle Grant offered through California State PTA and Gates PTA was awarded $600.00. Huge thanks to Ryan for obtaining this grant. The funds will be used to get additional equipment for the Kids Run the OC Program. Astronomy Night Committee: Help Family Event Chairs, Mark and Stefanie Nix and Mr. Hickson, Gates 6th grade teacher plan the 13th Annual Gates Astronomy Night. To participate, contact Mark or Stefanie at familyevents.gatespta@gmail.com. Jog-A-Thon Committee: Help Jogathon Chair, Bethany Ayala, plan the biggest PTA fundraiser. All hands on deck!! Show up Thursdays in the Teacher's Lounge from 8:00 am to 10:00 am. Camp Out Committee: Gates PTA will be starting a new tradition for our students - The Great Gates Family Campout! This new event will take place June 2 - June 3 out on the Gates soccer field. More information will be coming out in the next few weeks but we are going to need help from parents to create this unique experience for our children. We are looking for volunteers who have special camping skills or just want to help. Do you have contacts with Scouts who can help explain how to build a tent? Do you know how to make cool camp crafts? Can you play campfire songs on a guitar? Or are you a grilling machine who can flip pancakes or burgers? This event will take a lot of help but will create lasting memories for you and your family. If you are willing to help, please contact Mark & Stefanie Nix atfamilyevents.gatespta@gmail.com. There will be plenty to do but many tasks can be completed while you participate in the event with your family. Those who volunteer to help will get priority in registering for the event. Gates PTA is using a text messaging system called REMIND. This tool will not record phone numbers and short text reminders of PTA events in English and Spanish will only be sent out the day before an event. See flyer in Forms section of Gates PTA website for more details. Thank you Yovanna Medina for sending out the REMIND notifications. 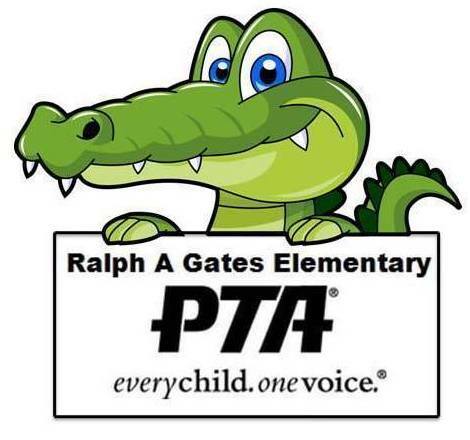 Gates PTA began using this communication tool for the 2015-2016 school year. It is intended to keep Gator families and staff up to date on PTA events. Paper flyers will continue to be sent home but many times they stay buried in our children’s backpacks. Please help spread the word to other parents. Interested parents should send an email to communications.gatespta@gmail.com to stay connected. I will monitor these requests until we can recruit someone to take on this position.